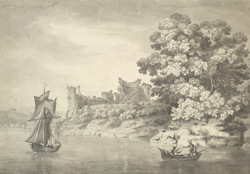 View of the Castle of Laugharne. The castle is located in Caemarthenshire on the south west coast of Wales. It stands on a precipice overlooking the Taf estuary. A ringwork castle was built here by the Normans in approximately 1116 but it was the de Brian family who built the stone castle. Guy de Brian I built the first stage of the castle in 1248, constructing the inner ward with two towers. Succeeding generations of the family added to the castle updating it and bringing it in line with modern military architectural thinking. After the death of the forth Guy de Brian in 1390 the castle was neglected. Sir John Perrot, Lord Lieutenant of England was granted the castle in 1575 and he converted it into a Tudor Mansion. After his death in 1592 the castle fell into ruin. The Welsh poet and writer, Dylan Thomas, lived just a few hundred yards from this castle, from 1949 until his death in 1953.